But I'm enjoying it equally so far, if not more, because there are some strong female characters in this book and I find the details of life at the time so interesting. The plague has not come up in the book yet, however, so I've got a ways to go. I have a thing for historical epics. 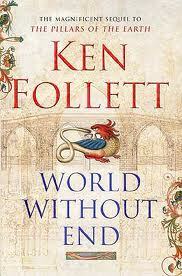 But more than that, I like the world-building effect of a really satisfying novel or series. Not only the big, sweeping historical moments like wars or social movements or monarchs, but the everyday details--what do they wear? what do they eat? how do they live? what did they think about love and survival and religion? World-building is why Harry Potter is so well-written. Think about it. 7 books and the rules of Rowling's magical world are consistent. Even when tensions escalate, it makes sense in the context of her world. The Lord of the Rings has languages and cultures with natural evolutions, steeped in the history that Tolkien created. Of course, that story has the hero setting out on a quest set-up, but think about the places he passes through. He meets different species in different lands. It's an adventure story, but there's a lot of detail and description and myth and lore that went into the entire imagining of Middle-Earth. Then there are Elizabeth Chadwick's books, which make you feel like you are inside the heads of her lead characters, living in the Middle Ages. This love of a whole, complete, foreign-to-my-existence-world may explain my apparent fetish for Regency-set romance novels. Even if they are not part of the same series, the world is familiar after reading about it. I bring this up because as I'm writing more of Iggy's story (which, unlike Pillars of the Earth, is not about a priory in its heyday, but one on its decline), the historical background is already there. In the early parts, the historical background consists of the early years of Henry VIII. Later, it's the divorce, Reformation, execution of Anne Boleyn and the Pilgrimage of Grace. The scope of this story is rather wide. I'm feeling some Follett influences in that respect. I thought about narrowing this story down to, oh, maybe a mere decade, but it wouldn't have the impact or the world I want it to be. So, the question is: do you like your books to take place in a tight time setting, say two weeks? Do you like a series of linked books? And what kind of worlds are you familiar with from reading?